Why are NYC flat fee MLS listings so rare? NYC flat fee MLS (Multiple Listing Service) listings are still very rare despite advances in technology and the city having the highest home prices and highest real estate commissions in the nation. Is it because it the market is too profitable for NYC brokers to offer discounts? But why are discount services so rare when there are over 30,000 real estate agents in NYC alone and not enough listings? Although NYC has over 30,000 agents and many thousands of listings at any given time, the industry is far less competitive than it may appear from the surface. This is because a large proportion of all agents and listings are controlled by a handful of large and dominant brokerages in the city. Licensed real estate salespeople at these major brokerages aren’t simply permitted to discount commissions. Every listing agreement or deal requires approval and sign-off by a managing broker at the firm. These large, traditional brokerages have unwritten policies which severely limit or altogether prohibit offering any form of discount or reduced commission services. The traditional school of thought suggests that although the vast majority of licensed real estate agents don’t close any deals in a given year and price fixing at 5-6% in real estate sales commissions per given sale only benefits a handful of stars, the masses of agents who don’t close deals still protect the status quo because of hope that they could potentially become one of these high earning star agents. As a result, even though the system they are helping enforce does not benefit them, these young and aspiring agents go out of their way to enforce the status quo by refusing to budge on prices and boycotting discount brokers (i.e. any NYC flat fee MLS company). This theory has merit because as home prices rise during every economic cycle, the number of licensed real estate agents increase in almost perfect correlation with home prices. Yet, even as the number of agents increases, technology advances and prices rise the typical NYC real estate commission has barely budged. An alternative explanation for why NYC flat fee MLS listings are so rare is because NYC doesn’t have an official MLS nor a dominant NAR (National Association of Realtors) affiliated local trade organization in New York City. While there is a Manhattan Association of Realtors (MANAR) which operates the Manhattan MLS, it is not very popular and many of the major NYC brokerages have refused to join it. As a result, the dominant trade group and inter-brokerage database is operated by REBNY (Real Estate Board of New York), which is a private NYC based real estate association. REBNY operates an inter-broker database called RLS (REBNY Listing System) which is purely a back-end database. REBNY residential brokerage members must use an approved “RLS vendor” such as Nestio, OLR, RealPlus or RealtyMX to view and submit listings to RLS. While REBNY membership is open to all brokerages that operate in NYC, it is still subject to a membership review process. For example, a REBNY application asks for the signatures of two different Principal Brokers of two current REBNY member firms. As you can imagine, part of the reason why NYC flat fee MLS listings are so rare could be because historically, NYC flat fee MLS brokers have had a difficult time being admitted to REBNY. As a result, NYC flat fee MLS brokers are typically unable to list in RLS which is the defacto MLS, or inter-broker database, in NYC. Another benefit of being in REBNY especially for brokerages with a lot of home buyer clients is that mandatory co-brokerage agreement that must be signed by each member. It essentially requires a 50% co-broke to be paid to a buyers’ agent if an agent does bring a buyer that ends up purchasing a listed home. It decreases the uncertainty buyers agents have over whether the listing agent will feel like paying them. As you can imagine, large national “for sale by owner” websites would typically have no issues getting access to the MLS in most parts of the country. However, they are at a total loss when it comes to a unique city like New York City. Looking for a NYC Flat Fee MLS Service? Buyer Beware! What typically happens when an unsuspecting NYC FSBO home seller purchases a package from a large, national “for sale by owner” company is that the company will list the seller’s NYC home in the New York State MLS, the Long Island MLS or some other irrelevant MLS which none of the brokers in NYC actually use. What’s even more shocking and damaging to NYC FSBO sellers is the fact that most of these large, national “for sale by owner” websites won’t even list the NYC home owner on local websites like StreetEasy! As a result, home owners are out of pocket $1000 or more for having been listed on an irrelevant state MLS and a few free websites like Zillow or Trulia which they could have easily done themselves for free. On top of that, if an unsuspecting NYC FSBO seller were to use the wrong NYC Flat Fee MLS provider, he/she would likely have to pay another separate fee to StreetEasy to list on that site! In addition, NYC FSBO sellers who select the wrong flat-fee MLS provider will likely be under constant harassment from listing brokers who now have an easy target to solicit as the home owner has flashed to the real estate community that he or she clearly doesn’t know what he or she is doing. Many of these large, national “for sale by owner” websites don’t even hide the fact that the listing is essentially a FSBO deal, even if it is listed on some MLS (likely an irrelevant one). Oftentimes, these FSBO companies watermark all of the owner’s photos and add the company’s URL to the listing descriptions. So not only do these FSBO companies not shield their clients from listing broker harassment, they make it even easier for listing brokers to identify, target and cold call these poor home sellers. As a result of all of these woes and reasons, NYC flat fee MLS listings have remained very are. The big national “for sale by owner” websites can’t penetrate the market because they show little to no awareness of the local market and NYC home owners are for the most part too smart to fall for their overpriced deals. Fortunately for home owners looking for a NYC flat fee MLS listing service, they now have a choice between going at it alone and paying 6% to a traditional listing agent. Hauseit is the only listing company in NYC able which offers intelligent sellers two options for significantly reducing or eliminating NYC real estate commissions altogether. 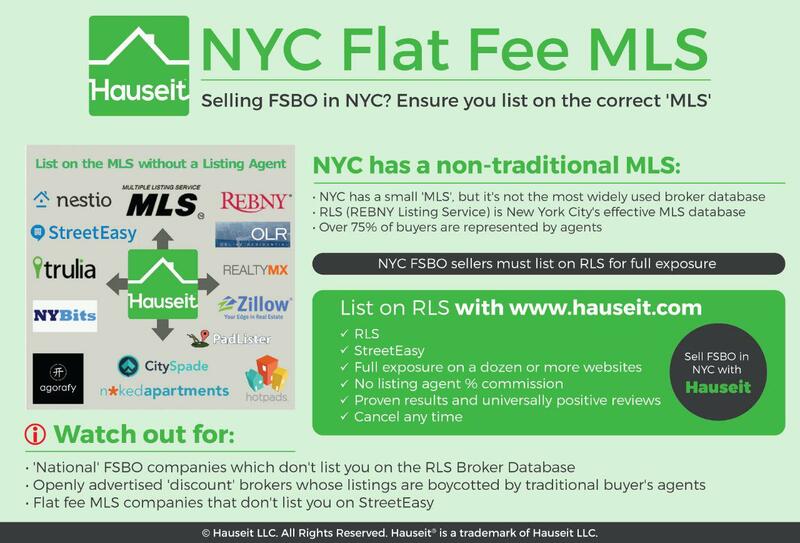 For FSBO sellers, Hauseit offers NYC home owners the most reliable and effective NYC flat-fee MLS service for a low, one-time flat fee. Your listing will be fully marketed on the NYC MLS (RLS) and dozens of other sites like StreetEasy by a full-service REBNY member firm for 0% listing agent commission. As evidenced by our universally positive reviews, our NYC FSBO flat-fee MLS listing service has been proven to be effective in finding both unrepresented buyers as well as represented buyers (who make up 75% of the total supply of buyers). 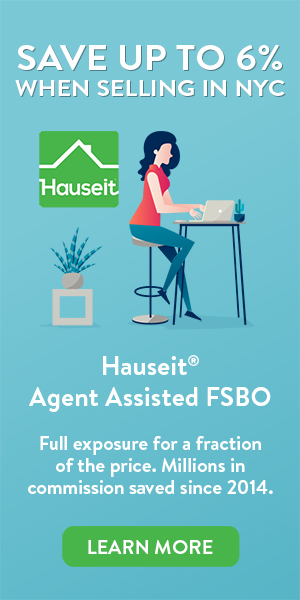 For NYC sellers who are too busy to list FSBO but still aren’t willing to pay 6% in commissions, Hauseit offers sellers the ability to work with a full-service REBNY member listing agent for only 1%.